The bothy was a little chilly in the morning, but still excellent protection from the marauding midges that would have been sucking our blood, given the chance. One thing I won’t miss about Scotland is having to pick dead midges out of my eyes. We got going by 9am, after an underwhelming breakfast of seed bread that had disintegrated entirely under the pressure of bike bag storage. The menfolk left it to me, opting to eat more structurally sound breakfast material themselves. 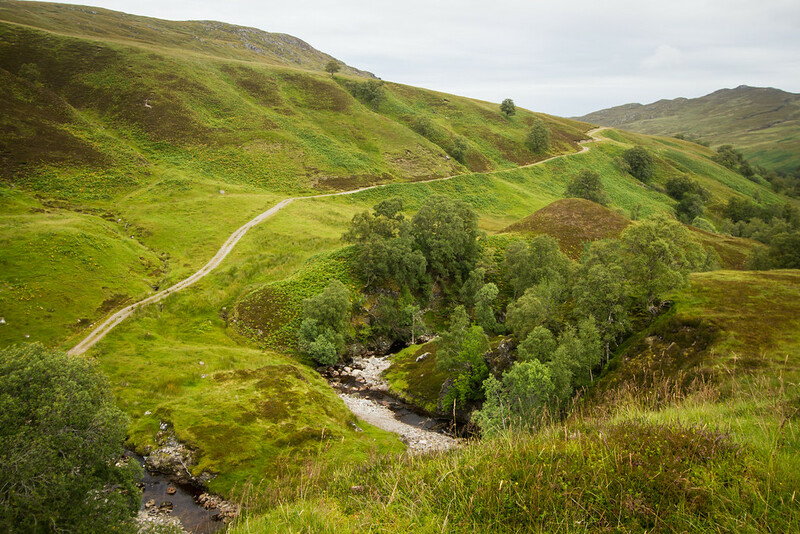 The climb up towards the pass from the bothy was steady, and mostly unrelentingly uphill. Steep enough to be challenging to ride loaded, but mostly not impossible. It is an ugly valley though. The powerlines are enormous, and scar the landscape with their accompanying road. The land around them just hasn’t recovered. The windfarm sat behind us – and there’s a quarry in there too. The sky was grey today, despite a tease of blue showing through the bothy window when we woke up. 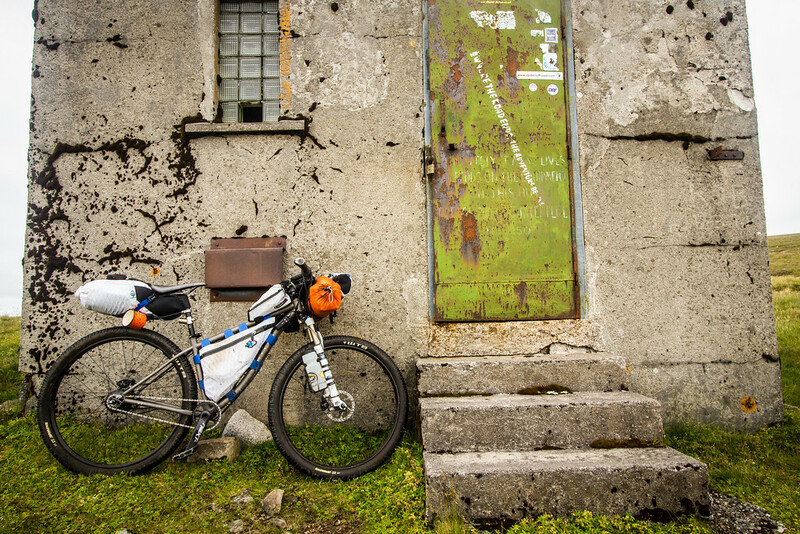 The summit has an old concrete bunker of a hut, with a padlock on the door that’s nearly worn through from the wind blowing it back and forth. It was cold and breezy, so we took just a few photos, then headed on and down. 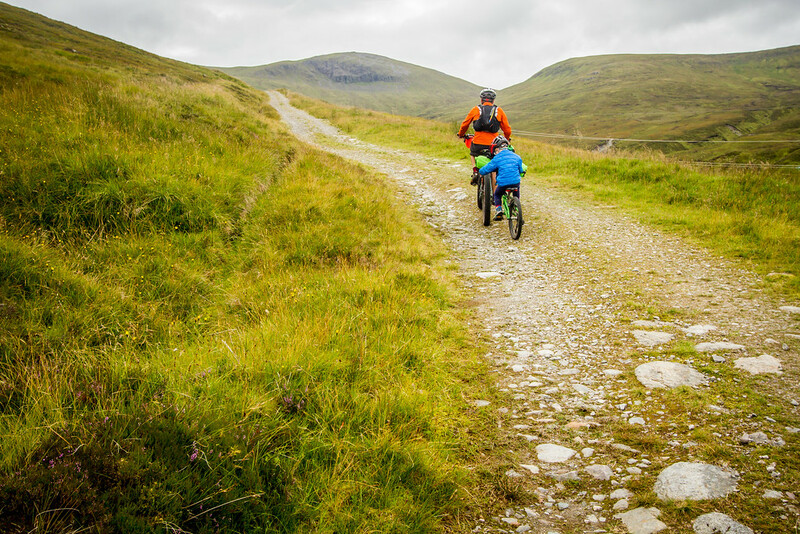 The descent switchbacks were rough and loose, invoking debate on the best way to ride the pass. We’re in favour of the direction we did it in, but admit to being driven a little insane by the endless drainage rock bars on the way down. 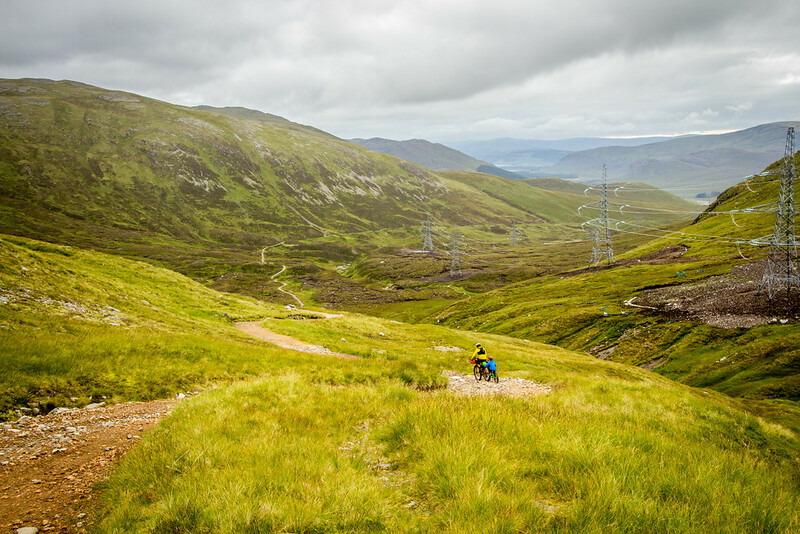 They’re not as bad as the ones on the Glen Affric-Kintail section, but they still force a slow and cautious descent. Then somehow, we were onto a narrow sealed road, although still at quite a high elevation. Still haunted by powerlines. 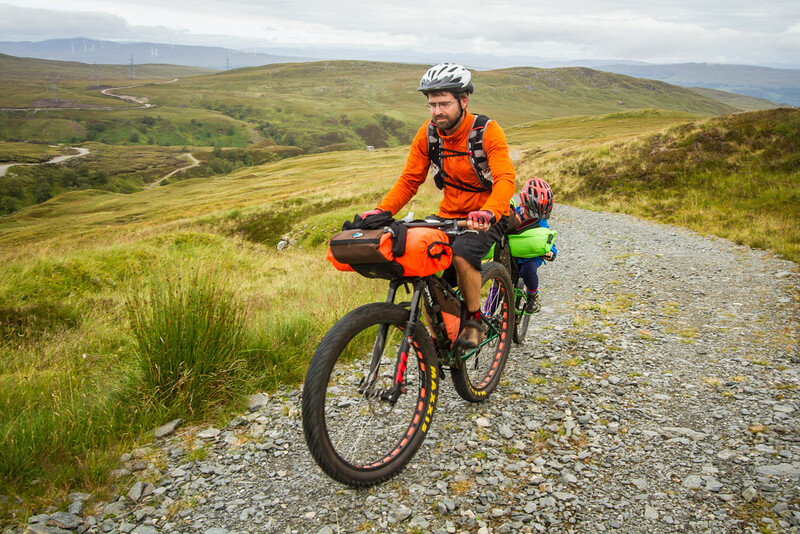 It was mostly flat or gradually downhill, and we covered ground quickly as we moved into crofting territory. The first town we reached was Laggan. 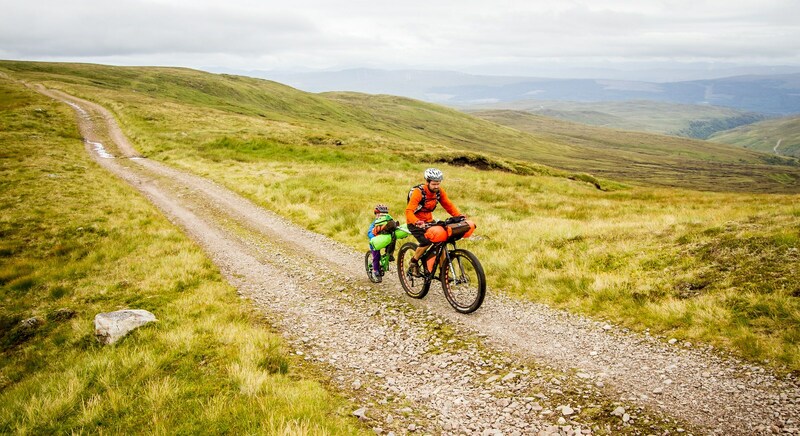 We sat around in the little store there, charging our phones, eating cheese toasties, glorying in the delights of warm running water, and then checking out the quality of their playground infrastructure. From there it was onto cycle route 7, but then a detour through Feshiebridge (partly because a bridge was down, and partly because it has an excellent name). 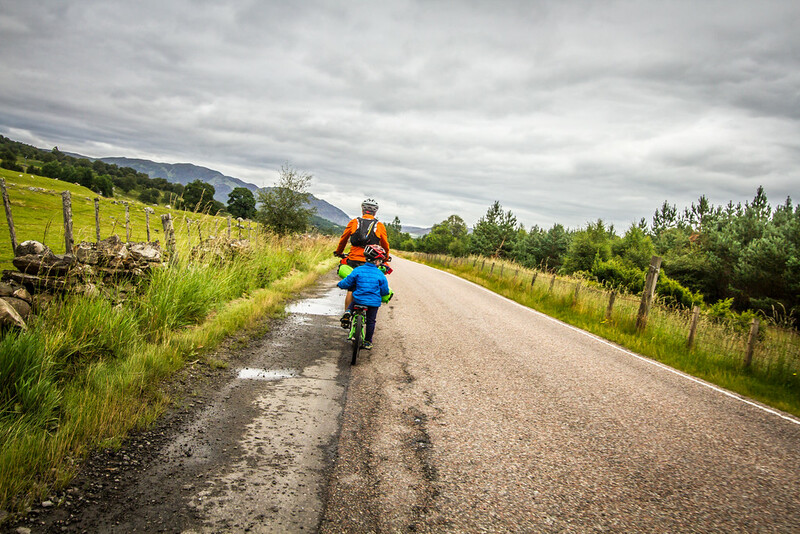 Slowly onwards, back onto cycle route 7, through forest on a narrow single lane road, and into the Cairngorms to finish up a very long day. 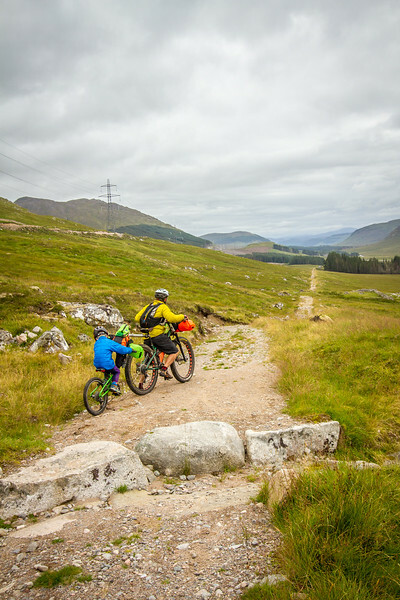 Coming into the Cairngorms, the cycling network exploded, and we met hoards of mountain bikers. Our campground had lovely showers, lacked in phone charging stations, but made up for it in being full of other people on bikes. This was our tribe. We debated how to spend our last day. An unloaded ride around here? Catch a train down to Edinburgh? 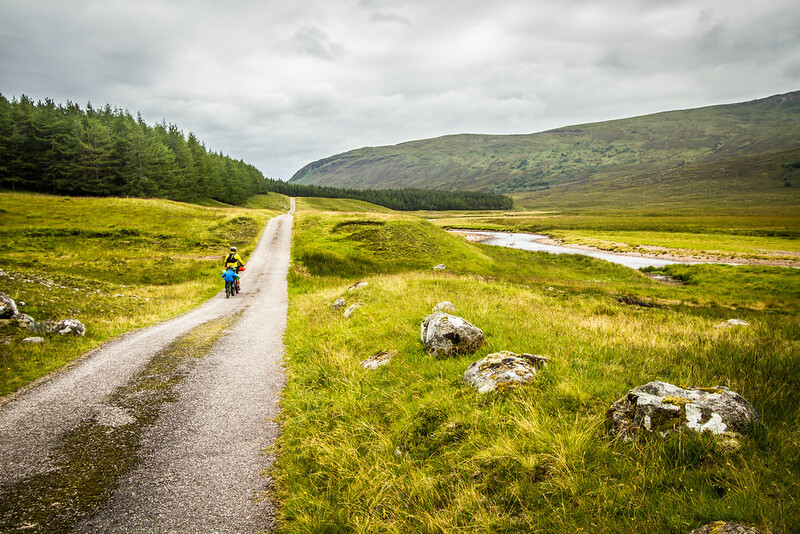 In the end we let inertia decide, waking up to uninspiring weather and tired legs, we paid to camp for another day, and spent a day in nearby Aviemore, glorying in delicious cafe meals with dessert. We ate a meal, then browsed around town long enough to justify eating another meal. Repeat. 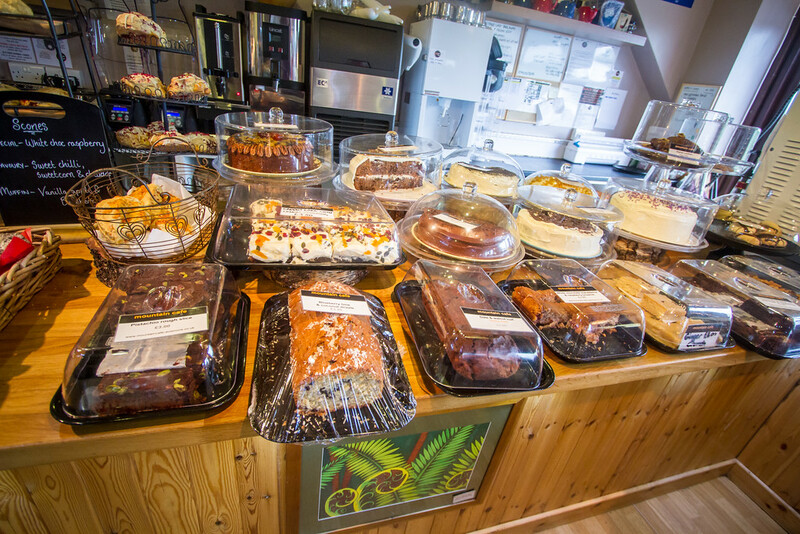 Oh, and the Mountain Cafe in Aviemore is highly recommended – check out the cake selection! That’s not even all of their cakes, and the food was also delicious.